Fungal skin infections are quite common, especially if your dog spends a lot of time outdoors. Things like hot spots, allergies, flea bites, and even breed- specific characteristics like floppy ears or skin folds can cause fungal infections. While there are medications that can help clear up these issues, using antifungal dog shampoos can help clear up the infection and get your dog back to their old healthy self. Just like human hair, the hair on dogs also gets dirty and needs to be washed regularly. Humans and dogs have very different requirements to maintain the right skin condition. Therefore, you need special formulations that suit your dog’s skin. Besides fungal infections, dogs can also get bacterial infections as well as a combination of both fungal and bacterial infections. So, if you see something you have to be sure it’s fungal before you begin to treat it with an antifungal dog shampoo. If you suspect that your dog has an infection, look for specific symptoms that separate fungal and bacterial infections. Fungal infections are often found in the ears, on the paws, in skin folds, and in the crease of the legs and armpits. This is because these areas are usually moist and work as a good host for fungal growth. These types of infections tend to be common in dogs with allergies so if your dog suffers from them you can assume that any infection is more likely to be fungal than bacterial. Similarly, if your dog just finished a round of antibiotics and is presenting signs of an infection, it’s likely to be a fungal infection since these often come on the heels of an antibiotics regimen. Finally, fungal infections are more common in warm weather when their bodies are more exposed to water. All that being said, you should always take your dog to a vet to properly diagnose any issues. This will ensure that your dog doesn’t have any other serious issues that might be linked to the infection. It will also help you get a full treatment plan in place to make sure your dog gets back to normal quickly. While there are a number of different fungal infections that present differently, yeast infections are one of the more common fungal infections your dog can experience and one that can be treated with antifungal dog shampoos. Antifungal dog shampoos are able to clear up various infections caused by fungi. They will also soothe the itching, burning, and other symptoms your dog might be experiencing. There are so many available on the market that picking the perfect one for you and your dog can be difficult even if you know what to look for and what to avoid. To help you shop, the best antifungal dog shampoos have been compiled and reviewed based on their descriptions as well as user feedback. This can help you narrow down your options and make an informed purchase decision. How Frequently & for How Long Can You Use Antifungal Shampoos on Dogs? Can Chemicals in Antifungal Shampoos Harm a Dog’s Skin? When we look at the causes of fungal infections, you will be amazed to see the number of sources that these infections can come from. If your dog has not contracted any yet, you should consider yourself a good pet owner. Let us look at some of the common fungal infections that happen to dogs. Caused by Aspergillus fumigates, this infection usually occurs in the nasal cavity or even in the paranasal sinuses. This is a common disease for dogs, especially in Collie and Greyhound breeds. You can identify this condition when your dog has nasal pain, bleeding through its nose, sneezes, and ulceration around its nostrils. This is usually caused by aspergillus tereus and it develops over a period of several months. It causes poor appetite, weight loss, fever, muscle wasting, weakness, vomiting, lethargy, and inflammation in the eye. This disease is most common in German Shepherds. This is a fungal disease which affects a small area at a time, unlike other diseases that affect the whole body. It is caused, generally, by Candida albicans. Though it is a very rare condition, it is dangerous. Symptoms include weakness, diarrhea and skin lesions. This disease, commonly known as ‘Valley Fever’, is caused by Coccidioides immitis. This generally caused in the dry regions of the United States. Though some dogs are fit enough to fight the infection on their own, other dogs may develop chronic respiratory symptoms. Treatment may take about 6 to 12 months. This particular brand of disease is caused by Cryptococcus neoformans and causes weight loss, lethargy, head tilt and back and forth eye movements. Pets require a long treatment period for this disease and even surgery, in severe cases. This rare fungal infection is caused by Geotrichum candidum, which is present in dead and decaying soil matter. Symptoms include coughing, poor appetite, fever, excessive water intake, vomiting, jaundice, and breathing difficulties. Other diseases include Histoplasmosis, Mycetomas, North American Blastomycosis, Phaeohyphomycosis, Pythiosis, and Rhinosporidiosis. Many fungal infections need the intervention of a vet but in some cases, they can also be handled using anti-fungal shampoos. Even though it may look like a severe infection and your dog probably seems miserable, yeast infections (and fungal infections, in general) are quite easy to treat, especially when you have the right products. Antifungal dog shampoos are a great tool to fight fungal infections along with any medications or other treatments your vet puts into place. As soon as you see sign and symptoms of a fungal infection in your dog or you simply notice that they’re not behaving like their usual self, take steps to find out what the issue is. If you’ve already dealt with fungal infections before you probably already know what to do but if you don’t start by seeing your vet. Once you know that you’re dealing with a fungal infection, start following your vet’s orders including using your antifungal dog shampoo. Follow all prescribed doses and frequencies of medications as well as any parameters for using the antifungal shampoo. If they don’t prescribe a specific one, you can safely use any trusted retail product that works. Make sure you follow the instructions on the specific shampoo unless your vet gave you specific instructions. For example, your shampoo might tell you to bathe the dog twice a week but your vet might tell you to only do weekly baths. In this case, follow your vet’s orders since they know your dog and how they’ll react to treatment. There are a lot of antifungal dog shampoos on the market and a lot of them are great. While having a choice is great, too much of a choice can lead to confusion so knowing what to look for in a proper antifungal dog shampoo can help you separate the really good ones from the substandard, cheap ones. The first thing to note is that even though a product may use the word “antifungal” on the label, doesn’t mean that it is, in fact, good for treating fungal infections in an effective manner. This is why you have to read the ingredient labels instead of just the product description labels. When shopping, you should also look to avoid certain ingredients that might harm your pup. For example, parabens, artificial dyes/colors, soaps, sulfates, and artificial fragrances tend to cause more irritation for sensitive dogs. If you’re concerned about creating more of a problem for your dog while treating their infection, avoid these types of ingredients and stick to more natural alternatives that are less likely to cause irritation or allergic reactions. Similarly, you may want to look for shampoos labeled hypoallergenic or certified organic. Luckily, there are also a number of natural ingredients that organic antifungal shampoos use that are just as effective as chemical ingredients. This includes rosemary essential oil, tea tree oil, peppermint oil, and lavender oil. Colloidal oatmeal may also be used in these. You should also look for dog shampoos that handle your specific fungal infection. For example, if you know your dog has a yeast infection, you can find dog shampoos specifically made to treat yeast infections. Whenever comparing antifungal dog shampoos, be sure to look at the customer reviews and take personal accounts into consideration since the first-hand experience is usually a better way to determine if a shampoo will be right for you and your dog. Sometimes the harsh ingredients used in a lot of antifungal dog shampoos are too strong for sensitive dogs. Similarly, you may not be comfortable using chemically made products on your furry friend. Luckily, there are natural antifungal dog shampoos available on the market that can work just as well as the chemical products. Natural antifungal dog shampoos can target specific conditions through natural ingredients that have antifungal properties. These ingredients will treat the symptoms and help your dog physically feel better while also clearing up the infection itself preventing it from spreading. Another benefit, and probably the best one, is that these products are safer for dogs than chemical shampoos. The risk of irritation is higher when you use a shampoo with harsh ingredients. This is because those ingredients tend to dry out your dog’s skin too much and can lead to more scratching, licking, and biting which can introduce more microbes into the area creating a worse problem. Harsh ingredients can also lead to allergic reactions and hot spots which can cause new infections on top of the current one. While it’s still possible for natural shampoos to cause poor reactions in some dogs, the likelihood is much lower since their gentler on your pup’s skin. In most instances, your vet will tell you how often to use your antifungal dog shampoo and will usually give you a specific timeline with an end date. If your dog has a chronic condition or is more prone to fungal infections, your vet may recommend using the shampoo continuously as their normal shampoo. While most antifungal dog shampoos can be used as a normal shampoo, medicated shampoos from your vet or strong shampoos bought on your own should be used with caution. Here, follow your vet’s instructions or the product’s individual instructions. For example, a specific shampoo might tell you to bathe your dog with the product twice a week until the infection visibly clears up then change the frequency to once a week for the next four weeks to ensure the infection is gone. Unless your vet tells you otherwise, you’d follow those specific product instructions. When bathing your dog with an antifungal dog shampoo, it’s recommended to make the bath water shallower than you would with a normal bath. This will help keep your dog from ingesting the soapy water accidentally. 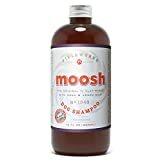 Since this shampoo may have stronger ingredients, they may cause digestive issues if too much of it is ingested so this lower water level is a good precautionary step. Similarly, avoid your dog’s mouth and eyes as you lather them up with the shampoo. Using an eye ointment that protects your dog’s eyes from shampoo can help here. Try to be gentle as you wash the infected areas on your furry friend. Infected skin is irritated and sensitive so if you’re too rough as you lather up your dog with the shampoo, you might cause them discomfort or pain. If you’re not gentle you also run the risk of making the irritation worse and spreading the infection. As you bathe your dog, try to lather up the shampoo for several minutes (around five to 10 minutes if possible). Then, leave the shampoo in place for around 10 minutes before rinsing it off. This helps the medication or beneficial ingredients soak into your dog’s coat and skin to properly fight the infection. If you bathe your dog properly following the shampoo’s or your vet’s instructions, you should see the infection begin to clear up over time. When the infection clears up completely your vet will tell you whether or not they recommend you continue to use the shampoo or switch to a normal one. That being said, some of the harsher ingredients (usually found in small amounts) have been linked to health problems. 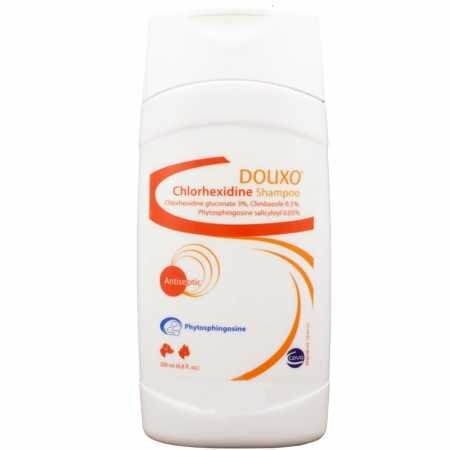 For example, chlorhexidine gluconate is found in some of the harsher antifungal dog shampoos. Also knowns as CHG, this is an effective ingredient against bacteria, yeast, and various viruses. In fact, it’s so effective that it might eliminate the good natural bacteria on your dog’s skin. This good bacteria is crucial for your dog’s autoimmune system and in keeping them healthy and regulated. The elimination of this good bacteria can lead to immune problems which can then lead to more skin infections since your dog won’t be as equipped to fight back against pathogens. Luckily, this can be remedied by introducing probiotics into your dog’s diet. This will help reestablish the good bacteria in your dog’s gut which will then translate to the rest of their body and boost their immune system once again. To sum up, shampoos with harsher ingredients are considered safe to use on your dog for short periods of time to clear up the infection in question. However, prolonged use might cause harm since it’ll compromise your dog’s immune system in the long run. More so, any shampoos made with harsh ingredients will have a tendency to cause irritation to your dog’s skin which can cause a whole host of problems including more infections. It’s best to monitor your dog while using any antifungal dog shampoo to make sure that they’re not experiencing any bad side effects or having an allergic reaction to it. If you’re concerned about harsh ingredients for your dog, consider all-natural shampoos without synthetic ingredients. Be sure to read the labels on what you buy because even shampoos that claim to be “natural” tend to still use some artificial ingredients especially dyes and fragrances. Yeast infections are common in dogs especially in the warmer months where the overgrowth of naturally occurring species of yeast called Malassezia is likely to occur. This yeast naturally lives on a dog’s skin, in their ears, and in other mucocutaneous areas. When the microbe begins to reproduce at a high, uncontrolled rate a yeast infection occurs causing your dog discomfort and sometimes pain. Since this type of infection is considered a fungal infection, antifungal dog shampoos work well to combat it. Antifungal ingredients, either synthetic or natural, work to kill the overgrowth of the bacteria and restore your dog’s health. These shampoos can be used alone or with oral medications like Ketoconazole or Fluconazole. If the infection is localized and not considered very severe, it’s possible to clear it up by only using a good antifungal dog shampoo or a combination of topical antifungal products including shampoos, sprays, and creams. Here are brief reviews of the top antifungal shampoos in the market today. This shampoo is made by Vet One, a leading company in pet supplies. It’s a medicated formula that is made to treat both fungal and bacterial infections in dogs (among other animals). 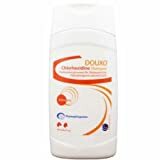 This is a strong and effective shampoo made with known antiseptics chlorhexidine (2%) and ketoconazole (1%). While its primary benefit is to clear up different skin infections, this shampoo will also clean your dog’s skin and coat and leave it odor-free. Since it’s a strong formula, it should only be used to clear up the infection and should be stopped once the infection is gone. The manufacturer suggests using the shampoo multiple times a week to see positive effects then limiting the use to once a week until the infection is completely gone. This is not only a top-selling antifungal dog shampoo, it’s also one of the most affordable medicated shampoo available. 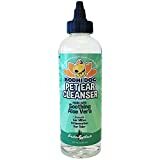 It’s proven to be effective against fungal, bacterial, and parasitic infections in dogs and is also known to treat Mange and more benign skin disorders. The formula is quite strong but also includes colloidal oatmeal and Allantoin that soothes your dog’s skin almost immediately while also hydrating it. There is also coal tar in the shampoo to battle back against flaking skin and chronic dandruff. While a strong shampoo, there are no parabens, artificial dyes, or drying soaps so it’s even considered safe for sensitive dogs and can be used regularly even after the infection clears up. 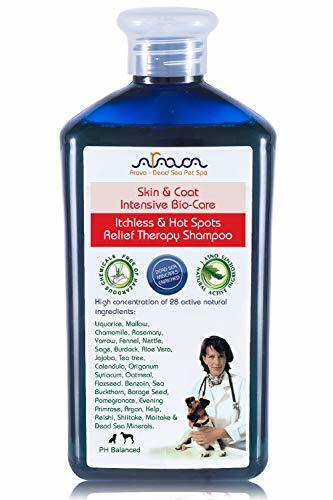 This prescription-strength shampoo is great for fighting superficial skin infections and similar skin disorders for dogs and cats but doesn’t require a prescription. The retail product can also successfully treat general skin issues like dandruff, inflammation, and itchiness. It contains strong, sometimes harsh, ingredients including salicyloyl-phytosphingosine, lipacides, and chlorhexidine in order to clear up infections and other skin conditions. Lipoproteins in the formula add hydration back into your dog’s skin to help limit residual irritation that some shampoos might cause. This antifungal dog shampoo was once only available through veterinarians but is now available for purchase. It contains miconazole and chlorhexidine to fight both fungal and bacterial infections. 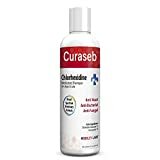 The formula also features ceramides to hydrate dry skin and repair any damage done by the infection or by your dog’s attempts to soothe their itchy skin. This is safe for cats and horses, not just dogs. Along with its infection-fighting abilities, this shampoo also deodorizes your dog taking care of the smelly odors that fungal infections tend to cause. While this isn’t a natural shampoo, it does contain some natural ingredients including lavender oil and lemongrass oil. This antifungal dog shampoo combines natural ingredients with synthetic ingredients to create a pet-friendly formula to clean your dog while clearing up common skin infections, hot spots, and benign yet irritating skin conditions including scrapes and abrasions. It will also enrich your dog’s coat making their fur soft and shiny free of odors, dandruff, and dirt. The Arava shampoo contains antifungal ingredients along with botanical oils as well as antibacterial ingredients. It also features kelp, rosemary, aloe vera, chamomile, fennel, and pomegranate for their nourishing benefits, natural aromas, as well as their natural antifungal properties. Unlike other shampoos, this one boasts their use of Dead Sea minerals in the formula to add potency and soothing factors that will help your dog feel better faster than other shampoos. This is another effective product from the research labs of SynergyLabs. This is a spray-on type shampoo can that be sprayed onto your dog’s coat where it acts and then removed using a towel. The shampoo contains Chlorhexidine Gluconate, Aloe Vera and Lanolin. It heals and soothes the scalp of your dog. Not only that. It also deodorizes your dog so that it smells fresh and clean. It relieves your dog of any fungal or bacterial infections. It is also a useful shampoo against dermatitis and pryoderma. This shampoo is specially prescribed for those dogs that have a sensitive skin. Pet owners should always consult a vet before buying shampoos, especially medicated ones for their pet. Pet owners often treat the symptoms rather than the disease, so it’s essential that you understand the root cause of any symptom before you buy a treatment solution. When you decide to buy products off the shelf, without consulting an expert, there are a number of things that you should be careful about. Let us look at some of these points. Shampoos that contain alcohol, like spray shampoos, are not advisable for pets since they cause cancer. Be aware of the compounds that your dog is allergic too and make sure that they are not present in the shampoo. The first step to a solution against fungal infections is identifying the underlying cause. These are some of the top-selling and highest rated antifungal dog shampoos on the market, but there are other effective shampoos, too. With so many good choices out there, you’re sure to find something to fit you and your dog’s needs. If you’re still unsure about what to use for your dog and their specific fungal infection, speak to your vet and see what they recommend. Remember, don’t try to treat an unknown condition on your own; when in doubt, get a proper diagnosis from your vet. Here is the list of best anti-fungal dog shampoo for you again. You can check specs, reviews, and pricing of the products at Amazon by clicking on the link. Have you used anti-fungal shampoos on your dog? What your your experience and which brand did you use? Share your experince by commenting below!